Rapnews.co.uk Rapnews.co.uk UK rap, grime and hiphop culture resource! » Blog Archive » Win a new THTC t-shirt! Win a new THTC t-shirt! Not that their range needed improving, the heads over at THTC have added seven funky fresh designs to their store. One is ‘Statue Of Terror’, an impressive illustration of Miss ‘Liberty’ holding a gat, with a cool blue tint. Another is ‘Babylon’, a colourful lions head and slogon over an earthy green. And you can win one of them! THTC.co.uk has given us two shirts of each design for you to try and get ya hands on. All you have to do to be in with a shout is answer the following question. E-mail in your answer no later than 7th of October. Open to UK residents only. 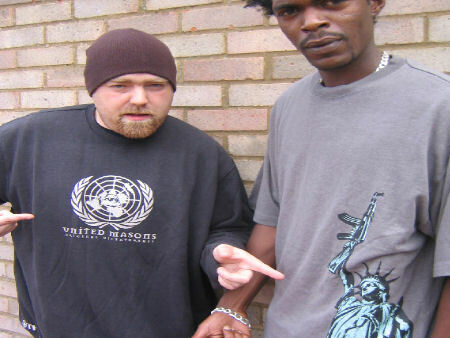 PhiLife Cypher, pictured below, are far from alone in wearing THTC clothing. Name three other artists who wear the brand too. 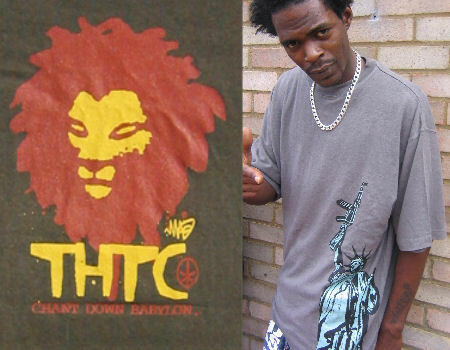 Visit THTC.co.uk to check out their other new designs and the existing dopeness. COMPETITION CLOSED. WINNERS: THOM, BEN, NICK, CODY.